uberon class called “heart” covers all hearts. processes. This issue is touched in Chimezie Ogbuji‘s presentation at DILS 2012. Will return GO-Uberon connections only. results, either EL++ or RL reasoning is required. In the next post I’ll present some possible options for issuing this query. These genes would be pretty fascinating, if they actually existed. Unfortunately, these were all annotation errors, arising from a liberal use of inference by sequence similarity. We decided to adopt a formalism specified by Wacek Kusnierczyk, in which we placed taxon constraints on classes in the ontology, and used these to detect annotation errors. You can see examples of usage in GO either in QuickGO (e.g. lactation) , or by opening the x-taxon-importer.owl ontology in Protege. This ontology is used in the GO Jenkins environment to detect internal consistencies in the ontology. The same relations are also in use in another multi-species ontology, Uberon. In uberon, the constraints are used for ontology consistency checking, and to provide taxon subsets – for example, aves-basic.owl, which excludes classes such as mammary gland, pectoral fin, etc. In the Deegan et al paper we described a rule-based procedure for using the taxon constraint relations. This has the advantage of being scalable over large taxon ontologies and large gene association sets. But a better approach is to encode this directly as owl axioms and use a reasoner. For this we need to use OWL axioms directly, and we need to choose a particular way of representing a taxonomy. 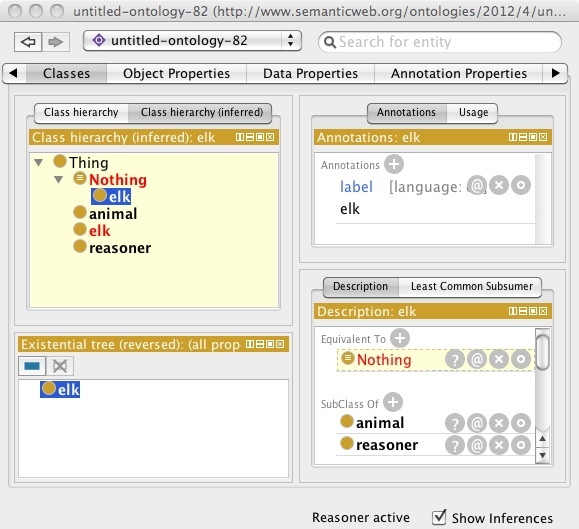 Both relations make use of a class-based representation of a taxonomy such as ncbitaxon.owl or a subset such as taxslim.owl. We can treat the taxon constraint relations as convenient shortcut relations which ‘expand’ to OWL axioms that capture the intended semantics in terms of a standard ObjectProperty “in_organism”. For now we leave in_organism undefined, but the basic idea is that for anatomical structures and cell components “in_organism” is the part_of parent that is an organism, whereas for processes it is the organism that encodes the gene products that execute the process. To achieve the desired entailments, it is necessary for sibling taxa to be declared disjoint (e.g. Eubacteria DisjointWith Eukaryota). Note that these disjointness axioms are not declared in the default NCBITaxon translation. GO also makes use of taxon groupings – these include new classes such as “prokaryotes” which are defined using UnionOf axioms.. They are available in go-taxon-groupings.owl. One of the uses of taxon constraints is to build taxon-specific subsets of ontologies. This will be covered in a future post.